Anything “gratin” is obviously going to be delicious. There is always too much food here, even when that isn’t the plan. 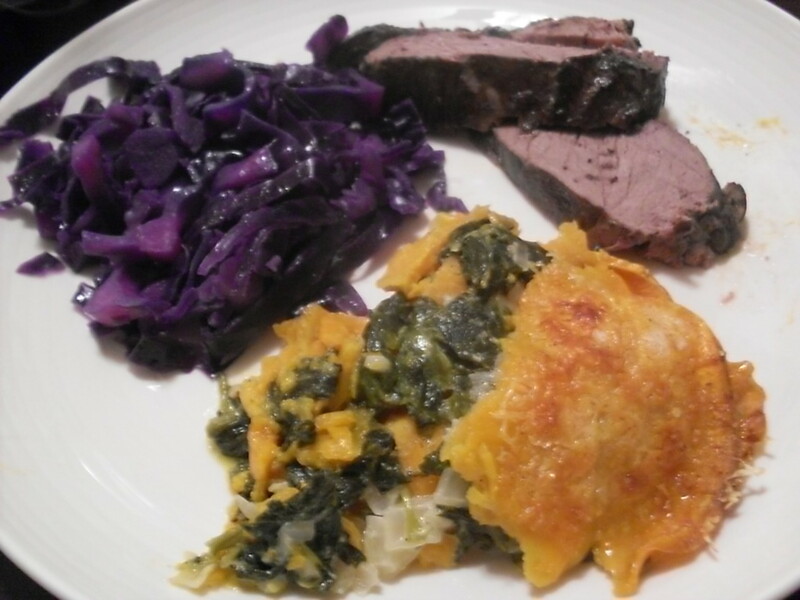 I made this venison roast, which if you’re feeding four people and estimating that each will eat a pound then there shouldn’t have been enough but I still have about a pound left over because holy crap delicious but filling, and I made this red cabbage, and it was amazing and simple and there was (were?) tons, and I made a gratin of sweet potato and spinach based on a similar recipe from my own personal copy of Gourmet Today, which I got for Christmas from Nick. And there was a lot of good red wine, Rioja from Paul and Zinfandel from Grace, and another round of kroketten, a smear of mustard, cartons of Whoppers, bowls of Dutch licorice, and a pie in my fridge that I never ended up reheating. The thing I want to tell you about is the gratin, though. I was so excited about it that I was all flustered and full of joy, and my pictures turned out blurrier than usual, but it was so effing delicious that there was no way I was going to go to bed and sober up before writing to you about it. Time is of the essence, and if it’s near midnight wherever you are like it is where I am, I’ll forgive you if you want to wait until tomorrow to make this. But make it as soon as you can, because it is so homey and luscious. The smell. The smell! It reminded me of memories I don’t even have but would happily make up. If you’re using frozen spinach, you don’t have to worry about this first part. Just drain it and chop it up and then put it into a large bowl. If you’re using fresh, follow me. In a large pot, bring one to two inches of salted water to a boil over high heat. Add spinach, forcing the leaves down with a spoon and turning until wilted, three to five minutes. Strain, drain, and rinse under cold water. Wring wet spinach out in a clean, dry towel. Transfer to a cutting board and chop coarsely, before transferring to a bowl. Melt three tablespoons of the butter in a heavy frying pan over medium-low heat. Add onions and garlic, and saute until softened and glistening, about three minutes. 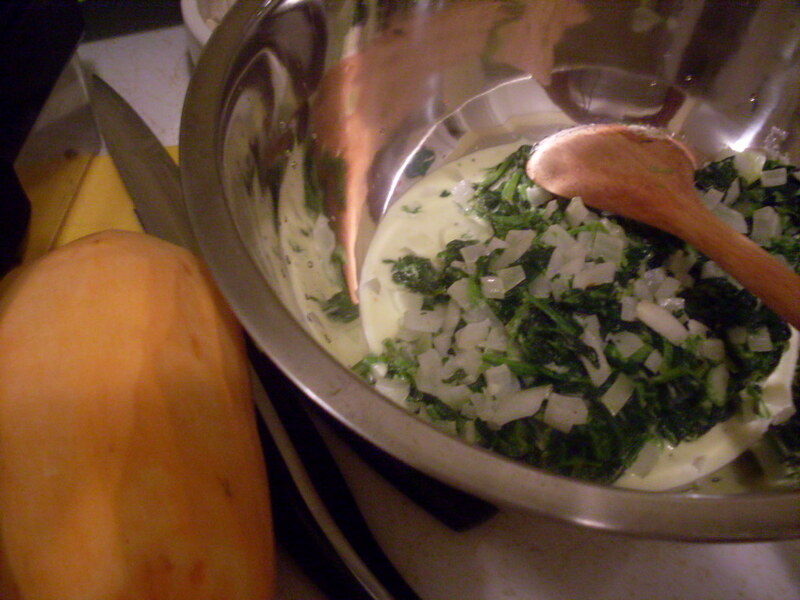 Remove from heat and add to spinach, along with salt, pepper, nutmeg, and cream. Stir to combine, and adjust seasonings as you like. Preheat oven to 400°F. 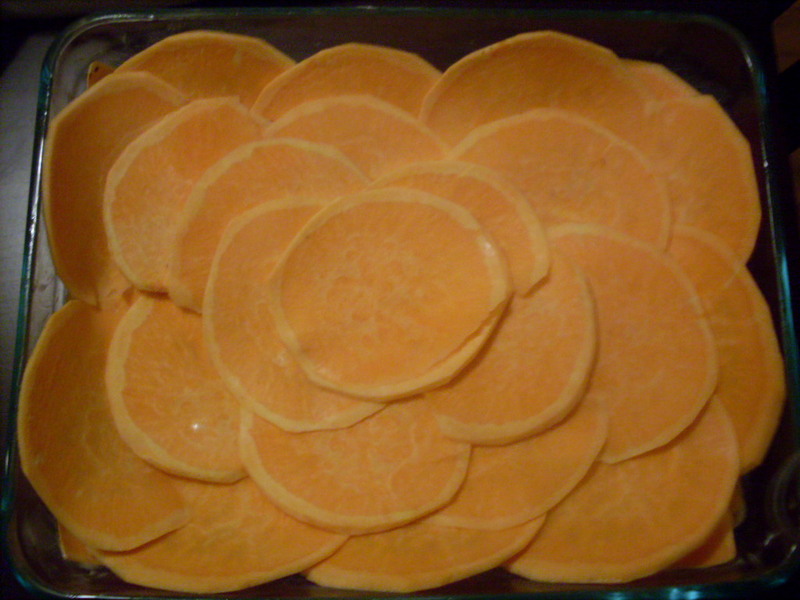 Line the bottom of a buttered 9″x13″ baking pan with thin slices of sweet potato. Do the math here – you’re going to need five layers of sweet potato, so divide your layers accordingly. About a fifth will do – if you can eyeball it, you’re better than me. My layers got thinner as they went. Spread one quarter of the spinach mixture on top of your first layer of sweet potato slices. Repeat three more times, until there are five layers of sweet potato and four layers of spinach. 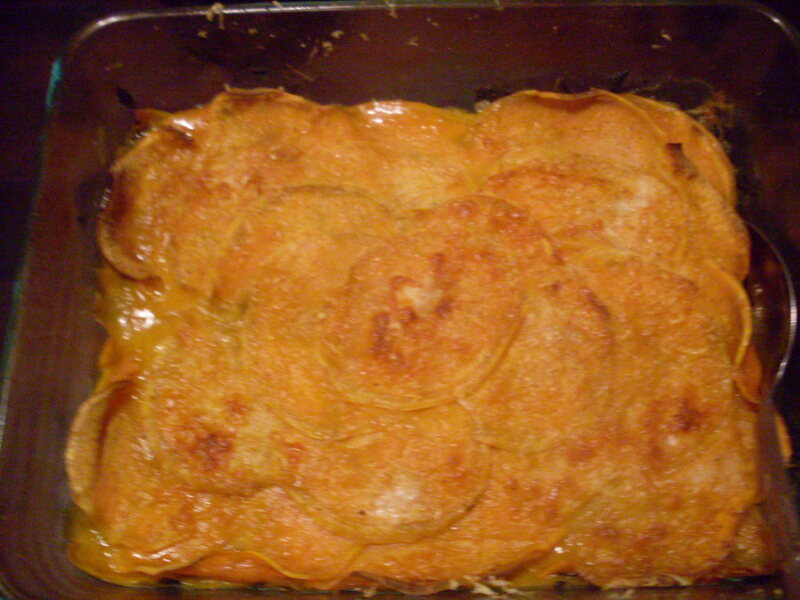 Drizzle any remaining liquid over the top layer of sweet potatoes. Sprinkle the top evenly with Parmesan, and then dot with remaining two tablespoons of butter. Cover top with a sheet of parchment paper, and bake until sweet potatoes are tender and the whole thing is bubbling, about 45 minutes. Remove paper and bake until crisp and browned on top, another 10 to 15 minutes. I'm sorry. This is where I got excited and everything went blurry. I wish I had read about this before Christmas, because I would have made it for dinner and perhaps seemed less like the freeloader I pretty much am, and people would have loved it. It’s showing up at next year’s feast, for sure. And at feasts in between, for certain. < Previous Kroketten: Make your holiday leftovers into delicious fried snack food.